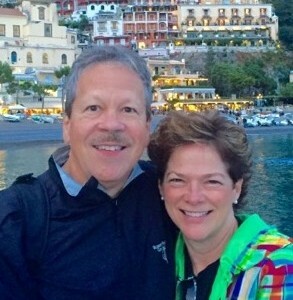 Six years after marrying his wife, Karen, David was diagnosed with a rare form of neuroendocrine pancreatic cancer. It had metastasized by the time it was discovered, and his liver was riddled with more than 100 tumors. Treatment began immediately with surgery followed by radiation. David waged the fight of his life for more than five years, but had very little to show for it. At low points, David questioned if this was how his story was going to end. He says that Isaiah 41:10 and 43:2-3 reminded him that even while going through a trial of faith, the Lord would not leave him. Out of options, David was referred to a doctor who specialized in multi-organ transplants. He advised David to move forward with the surgery while he was healthy enough to survive a transplant. It would take months to receive insurance approval and complete all necessary tests. A year passed before David was placed on the transplant list. Even if the transplant happened, David and Karen would have to leave their kids in Dallas (their youngest daughter was a high school senior at the time), and relocate to Miami where the surgery would take place. Their children encouraged David to move forward with the treatment in Florida. Friends offered to live in their home to keep things in order. An army of faithful friends prayed and offered practical assistance along the way. A few weeks after the Sandlins made the trip to Miami in July of 2013, David received the life-changing news that he would soon receive a new pancreas, stomach, small and large intestines and liver. At that point only fifteen people had successfully gone through a multi-organ transplant after neuroendocrine pancreatic cancer. Despite the risk, David was not afraid. When the surgery began, the doctor discovered that David’s stomach had disintegrated, and his liver was in terrible shape. “At that point many doctors would have stopped the surgery, but my doctor moved forward. Turns out the transplant happened at exactly the right time,” said David. After an arduous procedure, David was released from the hospital faster than any other patient before him. After one year, the Sandlins received the great news that there was no evidence of cancer in David’s body. Though the doctor cautioned him that the cancer could return, the chances were good that David would enjoy a great quality of life. 03 de March de 2016 a las 16:20 04Thu, 03 Mar 2016 16:20:38 +000038. David, you are my hero! You said from the beginning that you could endure any difficulty as long as you knew it was temporary. Twice I have watched you be so sick and your body so far from health that you looked closer to death than life, but step by step, you trusted God even when you didn’t have the strength, and here you are!! Thank you for never, ever giving up. Thank you for sharing your story of hope every where you go. Every time I hear you tell others of your story, I am reminded that God has a purpose in this journey, and you faithfully radiate His love and hope! You are prayed for and loved by those whose lives you have touched! 04 de March de 2016 a las 06:48 06Fri, 04 Mar 2016 06:48:57 +000057. What a wonderful story of faith and love! Thank you so much for sharing your faith, strength and hope! Such an inspiration!